The building was completed in 1753 as the colonial legislature (later Pennsylvania State House) for the Province of Pennsylvania and was used in that capacity until the state capital moved to Lancaster in 1799. 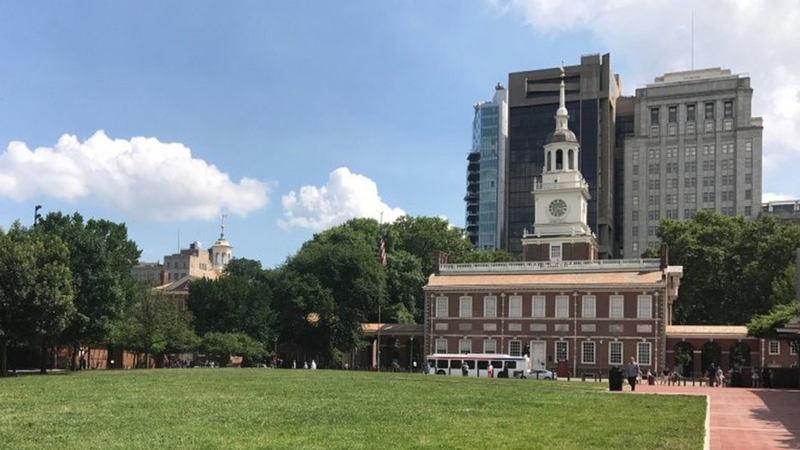 It became the principal meeting place of the Second Continental Congress from 1775 to 1783 and was the site of the Constitutional Convention in the summer of 1787. They risked everything — “their lives, their fortune and their sacred honor.” During the blistering summer of 1776, 56 courageous men gathered at the Pennsylvania State House and defied the King of England. Eleven years later, representatives from 12 states gathered to shape the U.S. Constitution, finally creating one unified nation. Rich in history, there is tons to explore at this UNESCO World Heritage Site. Independence Hall is also part of the U.S. National Park Service and an Independence National Historical Park. The guided tour of Independence Hall, led by National Park rangers, begins in the courtroom where lawyers from opposing sides shared tables and law books. George Washington’s “rising sun” chair dominates the Assembly Room which is arranged as it was during the original Constitutional Convention. In the adjacent West Wing, the actual inkstand used to sign the Declaration of Independence and an original draft of the Constitution are prominently displayed.